Based on industry developments initiated by the Federal Aviation Administration, EASA, the Royal Aeronautical Society and other regulatory agencies worldwide, the non-profit international Upset Prevention & Recovery Training Association (UPRTA) has been formed by upset recovery, stall/spin and advanced maneuver training experts to police quality assurance. With the mandate of ‘Do No Harm’ and a clear focus on reducing the leading cause of fatalities in commercial aviation, loss of control in-flight, UPRTA is an indispensable resource. UPRTA ensures training managers, air carriers and regulatory agencies have access to high-quality, industry-compliant, standardized and UPRTA-certified upset recovery training instructor pilots. Full compliance to the principles and teachings of the internationally recognized Airplane Upset Recovery Training Aid is just one of many crucial elements of a training provider’s safe and effective standardization. UPRTA considers upset prevention and recovery training to encompass the entire field of adverse flight-attitude and flight-envelope situations irrespective of whether they are pilot-induced, environmentally-induced or system anomaly-induced. Quality courses in Upset Prevention & Recovery Training must unfailingly focus on recognition and avoidance through enhanced awareness. Recovery training is crucial yet focus on ‘Recovery” on its own must not take precedence over the pilot’s education in prevention and diagnosis of potential upset situations to avoid them if at all possible. The Upset Prevention & Recovery Training Association is an international aviation organization devoted to flight training quality assurance and instructor pilot standardization. This entry was posted in News and Announcements and tagged flight instructor training, quality assurance, upset recovery. Bookmark the permalink. I wish UPRTA great success in reducing the worldwide LOC-I accident rate. 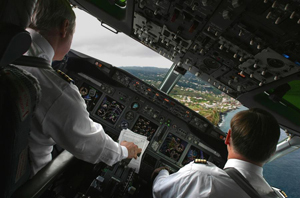 We need this clearinghouse for upset recovery training in order to standardize a professional pilot’s skills, training, and safety management on the flight deck. I am looking forward to the regulators stepping up to this needed emphasis.